If you have sensitive skin, most likely you react to the slightest irritation. Your skin becomes red and inflamed, and you have to try to figure out what sparked the reaction. What those with sensitive skin need are products made with ingredients that constantly give a calming feeling. Perilla seed oil is one of those ingredients. Containing high levels of essential fatty acids, the oil not only helps soothe and calm sensitive skin, but also provides a number of other benefits that will help your skin look plump, hydrated, and glowing. Traditionally grown in Asian countries, Perilla came to the U.S. in the late 1800s, brought by Asian immigrants. It has a strong, minty smell (though some have described it as more similar to cinnamon or licorice), and likes light to medium moist well-drained and rich soil, along with a lot of sun. It can grow up to four feet tall, with serrated leaves that turn purple to red in the fall. Both the young leaves and the seedlings are edible on this plant, raw or cooked. The leaves are often used as a spice, cooked, or fried, and may be combined with rice, fish, soups, and vegetables. You can add the seedlings to salads, and older leaves for flavoring in just about anything. In Asia, immature flower clusters are used in soups and chilled tofu, and the seeds to spice up tempura and miso. The Japanese also use it to make pickled plums, called “umeboshi plums.” In the U.S., perilla essential oil is often used to flavor foods, candies, and sauces. Both the leaves and the seeds have many good-for-you nutrients, including protein, fatty acids, and disease-fighting antioxidants. Perilla seed oil is also a healthy cooking oil, commonly used in Korean cuisine. You can use it to sauté vegetables, in salad dressings, or in other low-temperature cooking settings. 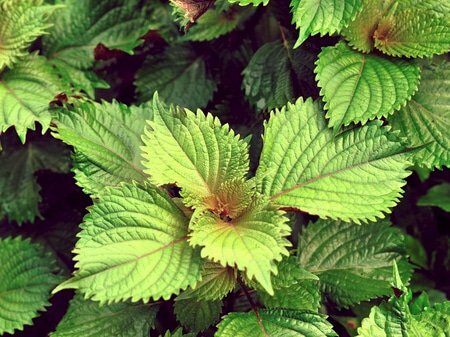 Historically, perilla was used internally to treat asthma, to soothe a stomachache, to relieve muscle spasms, and to treat coughs. Today, new research has shown the plant has exciting potential for your skin. Perilla stands out as far as what it offers the skin—especially sensitive skin. We’re talking now about the oil pressed from the seeds. This is considered a “carrier oil” (read more about carrier oils here), and it’s a great source of several different essential fatty acids, which are especially helpful for sensitive skin. These EFAs protect against environmental stressors to keep your skin looking young and refreshed. Could there be any ingredient more perfect for sensitive skin? Antioxidants: If you want to reduce the appearance of wrinkles and fine lines, antioxidants are key. Cleansing: This means the oil can help minimize the appearance of large pores, giving your skin a smoother, more flawless look while helping to reduce the risk of oily skin and clogged pores. Removes dirt and impurities: Because of its cleansing properties, this oil is well known as a powerful skin cleanser. The next time you’re looking for the perfect oil to take your sensitive skin from weary to looking lively, moisturized and vibrant, try some perilla oil! What do think of perilla oil? Have you used it for your skin? Please share any tips you may have. Perilla oil sounds like exactly what my skin needs. My skin is dry, but if I put too much moisturizing oils or cream on it, it rewards me with bumps (frequently, but not when I use coconut oil or sweet almond oil). Do you think it would have a healing effect on my rosacea? Inflammation, inside and on my skin, is something I struggle with often. I *love* that you help educate us consumers!! Thank you for sharing your knowledge & developing your products. They’re great! I just placed an order last night. I got a couple different oils but was wondering if I could try a sample of the new non smell oil. I loved the other oil and the smell is fine, but I have oily skin and acne skin now as an adult and I submit want to try three oils. I just ordered the anti aging again and the acne one but I’d like to try this one. Can I get a sample? Hi Alicia! We hope to have samples of the Unscented Facial Oil available soon. Until then, know that if you buy any of our full-sized products and are not totally satisfied, we will always work with you on a return or exchange.